Looks like we know where you'll be eating next week! 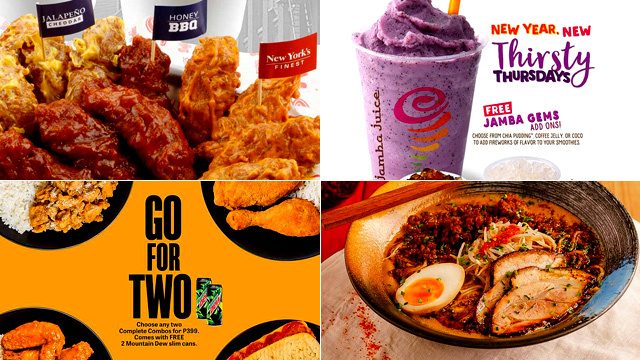 (SPOT.ph) Don’t let January pass without taking advantage of food steals and deals! In this week’s list, find out where you can score affordable meal sets, deals on drinks, and more. Also, save the date for National Chicken Fingers Day on Tuesday, January 29! 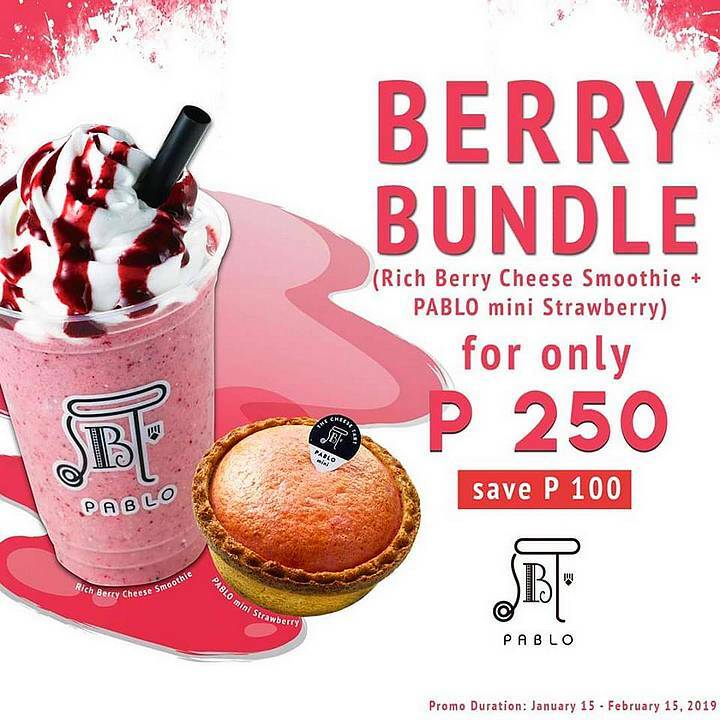 Here's something sweet to indulge in: Get a PABLO mini Strawberry and pair it with a Rich Berry Cheese Smoothie for just P250. Save a hundred bucks when you avail of this offer, valid until February 15—just in time for Valentine’s Day! See a list of PABLO branches. For more information, log on to PABLO's Facebook page. Turn over a new leaf this 2019 by heading over to The Old Spaghetti House. 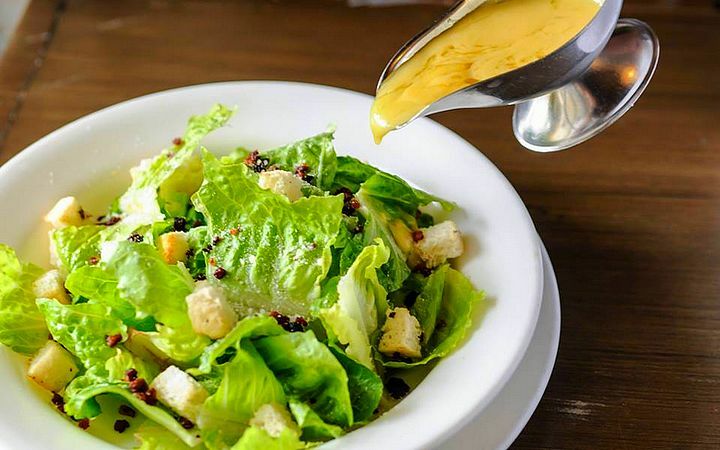 Score 20% off on their premium salad dishes. This promo runs until March 31, so there’s plenty of time to dig into your greens and eat right! See a list of The Old Spaghetti House branches. For more information, log on to The Old Spaghetti House's Facebook page. Ramen Shokudo isn't done celebrating their anniversary just yet! This time, you can enjoy your favorite ramen for just P50. All you have to do is order a bowl, and pay just P50 for a second one. Hurry, this offer is available only until February 3! Ramen Shokudo is at 401 Banawe Street, Santa Mesa Heights, Quezon City. For more information, log on to Ramen Shokudo's Facebook page. Each meal already comes with a can of soda. This promo is available for dine-in and takeout until March 31. See a list of Yellow Cab branches. For more information, log on to Yellow Cab's Facebook page. It's your last chance to enjoy Banapple's weekly offers! Get a free glass of iced tea when you order the Baked Fish Gratinee with Scalloped Potatoes on Wednesday, Fettuccine Jacintha on Thursday, or Bacon Fried Chicken Steaks with Milk'shroom Gravy on Friday. 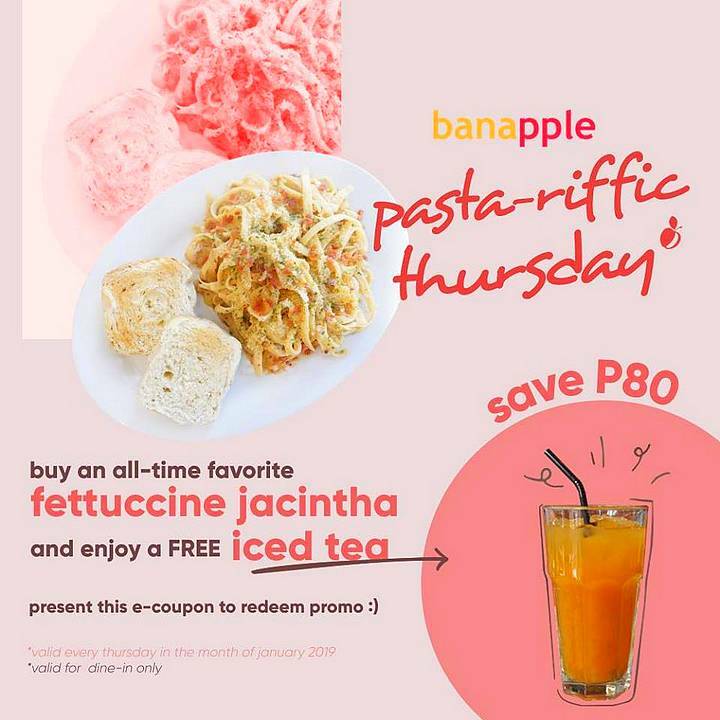 Just present the corresponding post from Banapple's Facebook page to take advantage of the offer, valid until January 31 only. See a list of Banapple branches. For more information, log on to Banapple's Facebook page. 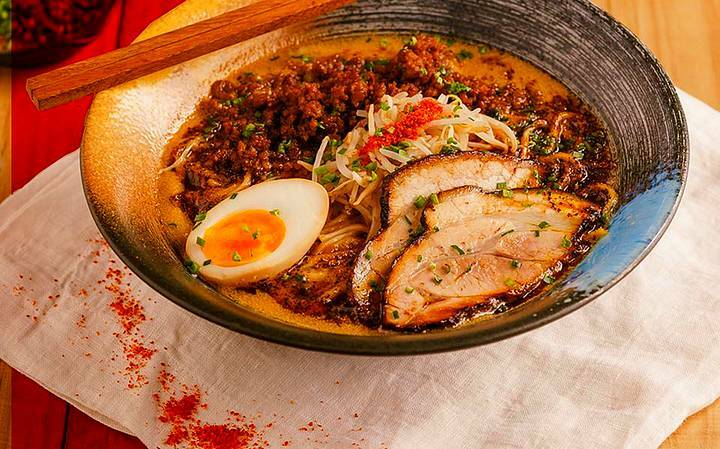 This one’s for those who can’t get enough of ramen! Head over to Kichitora and get a free refill on noodles for any ramen or tsukemen order. Hurry, noodle lovers—this offer is available until January 31 only. 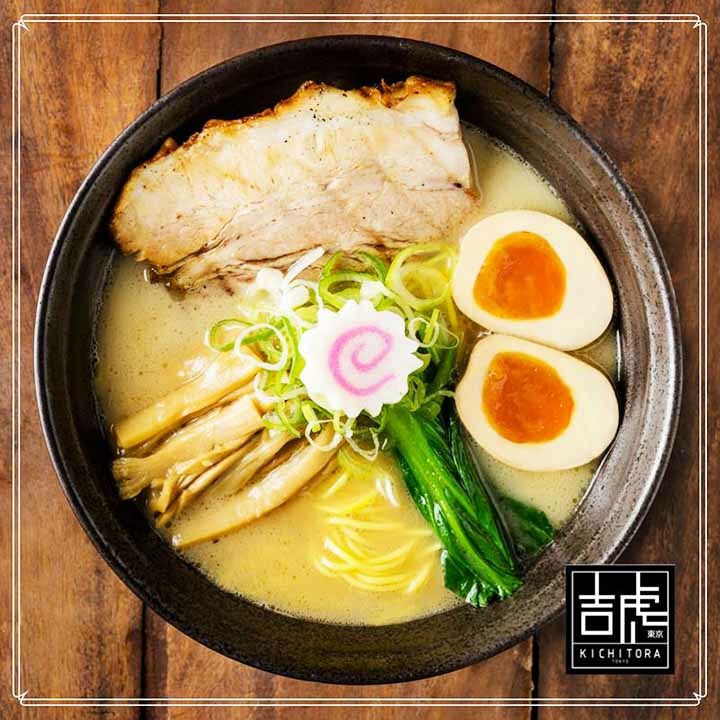 Kichitora Ramen is at 3/F Central Square, Bonifacio High Street, Bonifacio Global City; and 2/F Mega Atrium, SM Megamall, Ortigas, Mandaluyong City. For more information, log on to Kichitora Ramen's Facebook page. Save the date: This coming Tuesday is National Chicken Fingers Day at Buffalo’s Wings N’ Things. 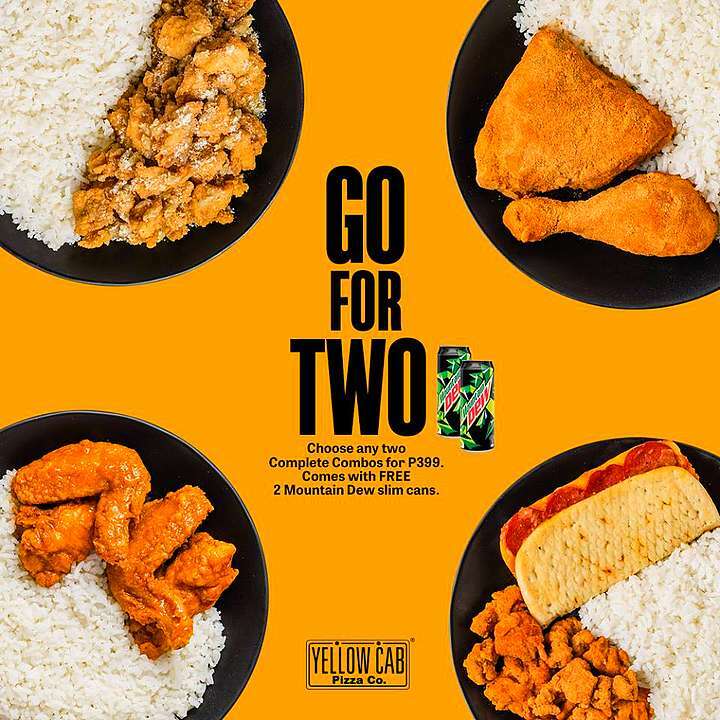 As part of the celebration, you can get a Triple Sample Original Chicken Fingers with three cups of rice—all for just P198. That’s 12 chicken fingers with three types of sauce to match. Come hungry! 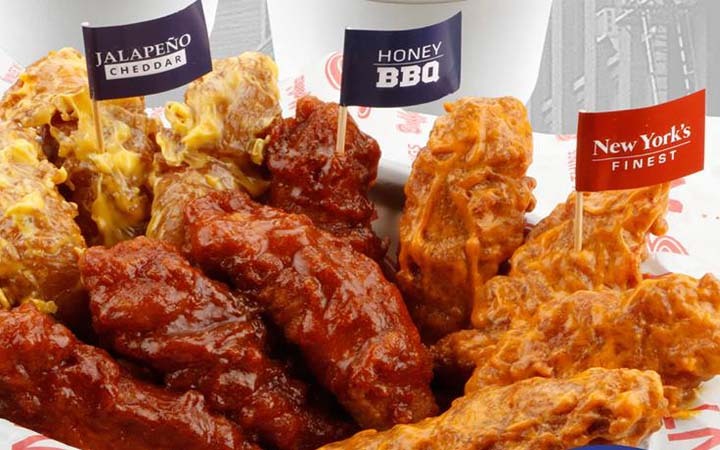 See a list of Buffalo's Wings N' Things branches. For more information, log on to Buffalo’s Wings N' Things' Facebook page. 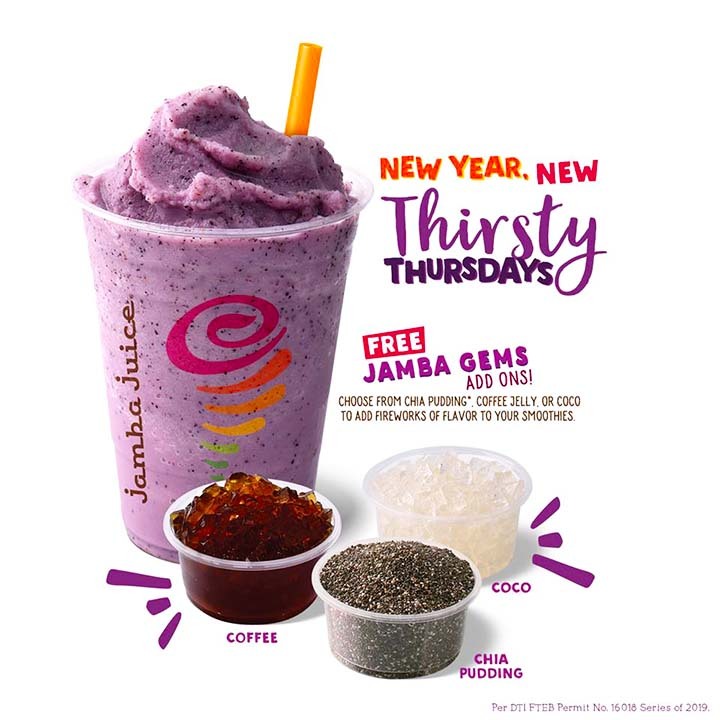 Jamba Juice has a new offer for their Thirsty Thursdays: Get free Jamba Gems when you order your smoothie. Your choices include Chia Pudding (blended with soy milk), Coffee Jelly, and Coco. Catch the last run of this promo on January 31! See a list of Jamba Juice branches. For more information, log on to Jamba Juice's Facebook page. 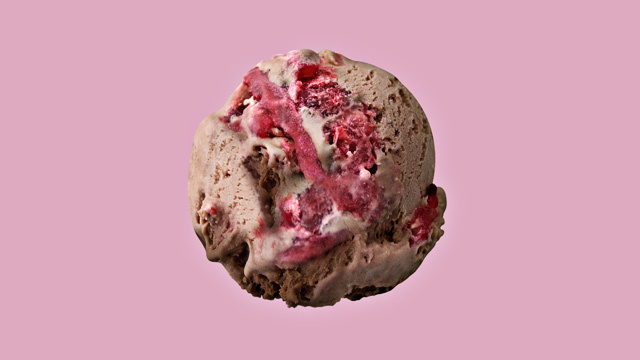 Satisfy your sweet tooth with Terraz’s latest promo! Enjoy a 30% discount when you order selected cakes by the slice or by the whole, starting at 7 p.m. 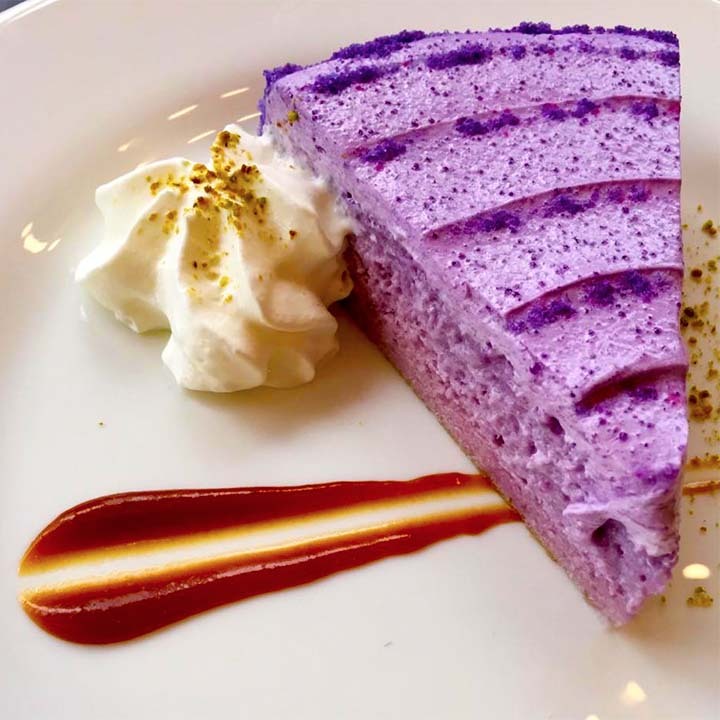 Participating flavors include Jackfruit Sansrival, Frozen Brazo, and Ube Tres Leches. Take advantage of this offer every Thursday and Friday. Terraz is at 3/F Zuellig Building, Makati Avenue corner Paseo de Roxas Street, Urdaneta, Makati City. For more information, log on to Terraz' Facebook page. Want to score free wings? Head over to Hot Star Large Fried Chicken! Add a regular drink to your XXL or Junior Chicken Meal and get two free wingettes. 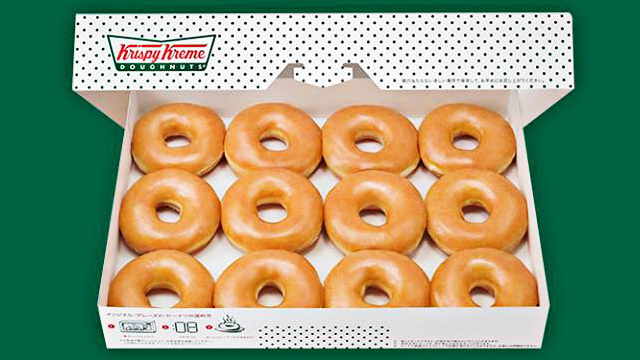 You can also upgrade to a large drink to get three free wingettes that you can munch on. 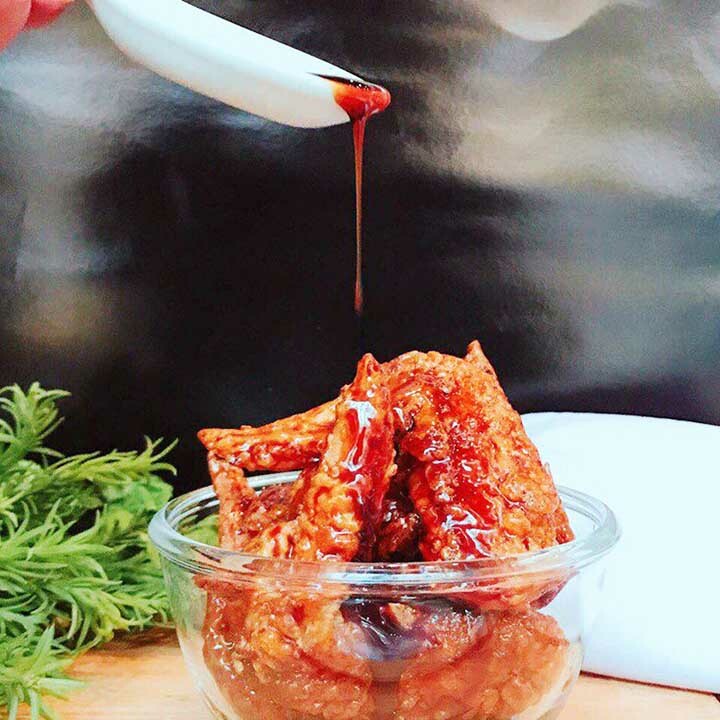 See a list of Hot Star Large Fried Chicken branches. For more information, log on to Hot Star Large Fried Chicken's Facebook page.